“When my mother died, the music stopped in my house,” said Isabel Heredia. Her mother wasn’t a professional singer, “but she had a fantastic voice. She sang at parties.” Isabel enjoyed singing with her mother at their house in San Francisco but didn’t do any formal singing herself as an adult, although she had been in a choir as a girl in Cuba. Alzheimer’s clouded her mother’s last years, making life hectic for Isabel, who was her mother’s primary caregiver. She was overjoyed when she heard from a friend about five years ago about the chance to join a community choir for free as part of the Community of Voices study that was being run by the University of California San Francisco. The study aimed to see what impact singing in a choir would have on the quality of life for older adults, particularly those from diverse cultural backgrounds who hadn’t recently been in a choir. The study set up twelve choirs in senior centers and community centers around the city. A music school, San Francisco Community Music Center, worked with the university to create the project and provided teachers to lead the choirs, which sang in English as well as in Spanish and Tagalog. Isabel Heredia (center) singing with Coro Solera, a San Francisco Community Music Center choir that was part of the Community of Voices study. Image Credit: Courtesy of Isabel Heredia, photo by Martha Rodríguez-Salazar. Used with permission. “This was tailor-made for me,” said Heredia. “I wanted to sing in Spanish! I already knew a lot of the songs—folk songs, oldies, classics”—songs she had loved singing with her mother. She joined one of the choirs, after first completing an assessment that all study participants had to do: memory exercises and tests of physical, mental, and emotional health. “They did the tests every few months to see if there’s progress. I didn’t mind. I just wanted to sing,” explained Heredia. The NIH-funded Community of Voices study, one the first randomized controlled trials of a choir intervention, is now completed and its findings, published recently, note that for adults age 60 and over who had not been regular choir members before the study, singing in a choir reduced feelings of loneliness and increased interest in life, compared with similar adults who weren’t in a choir. Other research has found that high rates of loneliness, social isolation, and depression among older adults can cause health problems. Now that adults age 65 and over are the fastest-growing segment of the U.S. population, choruses for older adults are springing up around the country. 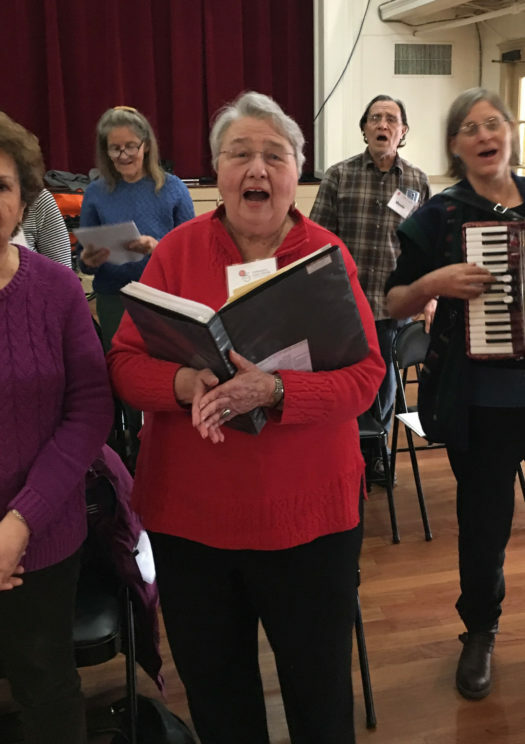 In addition to the music school’s choirs in San Francisco, New Horizons International Music Association and Encore Creativity for Older Adults offer choirs specially for seniors in a number of locations. Multi-age choruses at music schools and religious organizations may also welcome singers of all ages and abilities. And for those who wish to create their own choir for seniors, help is out there. Featured image: Handel, closing bars of Hallelujah Chorus. Public domain via Wikimedia. 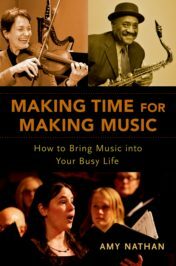 Amy Nathan, an amateur pianist and choral singer, is an award-winning author of nonfiction books for adults and young people, including three books for Oxford University Press: Making Time for Making Music: How to Bring Music into Your Busy Life;The Music Parents’ Survival Guide: A Parent-to-Parent Conversation; and The Young Musician’s Survival Guide. Other books include: Meet the Musicians, Meet the Dancers, Round and Round Together, Yankee Doodle Gals, Count On Us, Take a Seat-Make A Stand, and The Kids' Allowance Book. A graduate of Harvard with masters' degrees from the Harvard Graduate School of Education and Columbia's Teachers College, she is the mother of two musical sons: her older son is composer Eric Nathan; her younger son is a saxophone-playing political scientist. Singing in a choir really makes a different I the life of senior like me. I am happy that my friend invited me to join the 30th ikdervadult choir in 2014th. I enjoyed it very much. I love singing. Because I love singing, i asked the people in charge of the study if I can join them. They did not let me join because I have been singing in a choir. So after the study, they create more choirs. Since I enjoyed singing, I join another choir the Bernal Heights Choir that sing only in English. Then I decided to join another choir. The Centro Latino choir that sing only in Spanish. The 30th choir sings English, Spanish and Tagalog. Now I join another choir that sings in Tagalog which I am very fluent. I am very happy that I joined the choirs. I have learned a lot how to sing the right way. Now I am not ashame to sing in front of the audience because I can sing the right way in English, Spanish and Tagalog. Thanks to our Directors Martha Rodriguez Salazar, with Jennifer Perringer, Billy Philadelphia and Red Reyes. This is great! Glad we got to read about our friend Isabel. Wish we had seen the interview. She is especially special in person! I am the youngest (75) in a Seniors in Retirement choir in Marin. We too go to senior living places and I have witnessed amazing responses from their residents. Music is definitely therapy. I am 86 years old and belong to a group called the troubadours in Cincinnati Ohio. We entertain at nursing homes retirement centers and senior centers. Been with this group for 20 years and joined after I retired from work. We sing solos and we sing as a group and I am the head of the group and we always have songs where we ask the audience to join us. We have entertained at Alzheimer facilities and I have seen people come in with their heads down and almost asleep and when we sing certain songs like take me out to the ball game and God bless America they pick their heads up and they start singing and smiling. It not only makes the people of these facilities feel good but it warms my heart makes me feel great. Thank you Elmira, Marcie and Barbara for sharing your enthusiasm for your choirs — and for the joy your choirs’ performances bring to others!